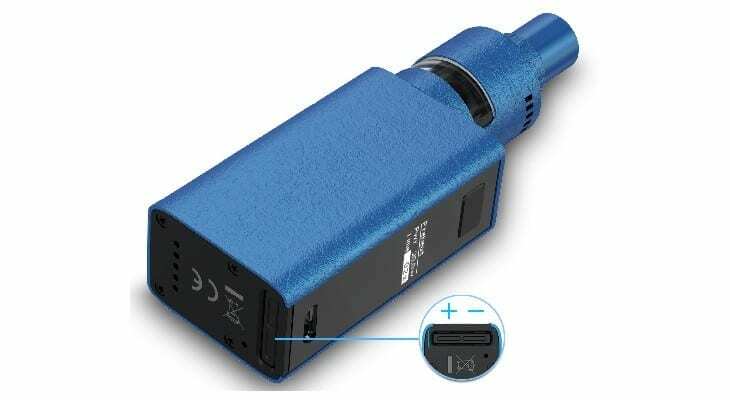 When looking at the wide, expansive world of vaping, there are tons of different units and devices to choose from. There are plenty of options available for folks looking to get something that offers tons of controls and settings to tinker with, and while these options are great for the people that want them, these choices can often be a bit overwhelming for someone that’s looking to just get started with the act of vaping. Today, I’m going to give you my full and unbiased Joyetech eVic review. The Joyetech eVic has been making a lot headlines recently, and with good reason. The Joyetech eVic offers temperature control and an easy-to-read screen at a fairly low price. There are tons of choices out there for starter vapes, but is this the best one out there for folks looking to tinker with temp control? Let’s find out in my Joyetech eVic starter kit review. I can strongly recommend it as one of the best starter vapes for people who are just starting out in the world of vaping and want an affordable gadget to start tinkering with temperature control settings. Wide Temperature Range – The Joyetech eVic allows you to adjust your temperature between 200 and 600-degrees Fahrenheit, meaning that you’ve got a great deal of control over how cool or warm you want your vape to be. Some people may not be all that interested in this, but for those looking to really get involved with temperature control, this is a great asset. Tank Capacity – In regards to how much the included tank here is able to hold, you’re looking at a total capacity of 4ML. Included Rubber Cover – While the Joyetech eVic certainly does look quite nice from a design standpoint, it is a bit on the slippery side. To help add some extra grip to the vape, Joyetech has included a rubber cover that actually works quite a bit better than I was expecting. It isn’t anything special, but getting added grip with the purchase of the vape certainly is a nice value-add. Stealth Mode – If you want to be a bit more inconspicuous with the way that you vape, Joyetech has included a Stealth mode that allows you to use the eVic without powering on the included OLED display. This is a great feature to have if you’re in a dimly lit area and don’t want to both other people around you while using the eVic. With some vapes, controlling the actual temperature of the unit you’re using can sometimes prove to be a bit of a hassle. Thankfully with the Joyetech eVic, this isn’t an issue at all. To adjust the temp, simply tap the power button three times and then you have instant access to your temperature control and all of your other settings. When you do find yourself adjusting settings on the Joyetech eVic, you’ll be able to see all of your information on its big and bright OLED display. The screen here is able to cram in a ton of information at once, and even when used outdoors, the screen is still quite easy to see. This was easily one of my favorite features when conducting my Joyetech eVic review. Despite having a lot of tech and power packed inside of it, Joyetech was somehow able to keep the eVic quite small and compact when compared to competing vapes. Users with small to medium hands shouldn’t have any trouble at all using the Joyetech eVic, making it easily accessible for pretty much everyone. The included battery of the Joyetech eVic, while non-replaceable, does last an incredibly long time. The 5000 mAh capacity allowed me to get around 2000 seconds of vaping with my settings set at 500-600 degrees Fahrenheit and 60-watts. If you figure that the average person vapes about 3 puffs for 3 total seconds every 20 minutes or so, that works out to 4 and ½ days of use on a single charge. While the included battery inside of the Joyetech eVic is quite large (5000 mAh), I’m not a fan of the fact that it isn’t replaceable. While some might prefer the baked-in battery, this can often hurt the resale value of your vape if you decide to sell it at some point down the road. On top of this, the included 1-amp charger means that recharge times are extremely slow. Another issue I faced with the Joyetech eVic is the placement of its rocker. Because of the way that Joyetech positioned it on here, accessing your fire and left/right controls can sometimes be a bit cumbersome and awkward. This certainly isn’t a deal-breaker by any means, but it is something that proved to get a bit annoying at times. So, where does that leave us with my eVic Joyetech review? This is a fantastic vape for those looking to get started with temperature control settings. More experienced users might long for additional features, but the eVic offers a large battery (albeit a non-removable one), a bright OLED screen, and awesome temp controls in a compact body. This really is one of the best vapes you can buy if you’re new to the vaping world, so the eVic’s small issues aside, this one is an easy purchase.